This is a quick guide to the packet mixes out there. These are pretty easy to make and the only kit you need is a half decent non-stick pan, whether the traditional Teflon type or one of the new fancy and greener ceramic non-sticks! Plus a good fish slice, plastic or silicone. Whether you want thicker American/Scotch style thick pancakes or thinner, larger crepes - it's up to you, just reduce or increase the liquid accordingly. Start thick and thin down as you need. And while this is a breakfast recipe, savoury pancakes are also a nice and easy way to serve some delicious stir-fried vegetables for lunch or supper! Look out for these brands - some may be available on supermarket free-from shelves, others from health food shops. Most or all of these are GF too. 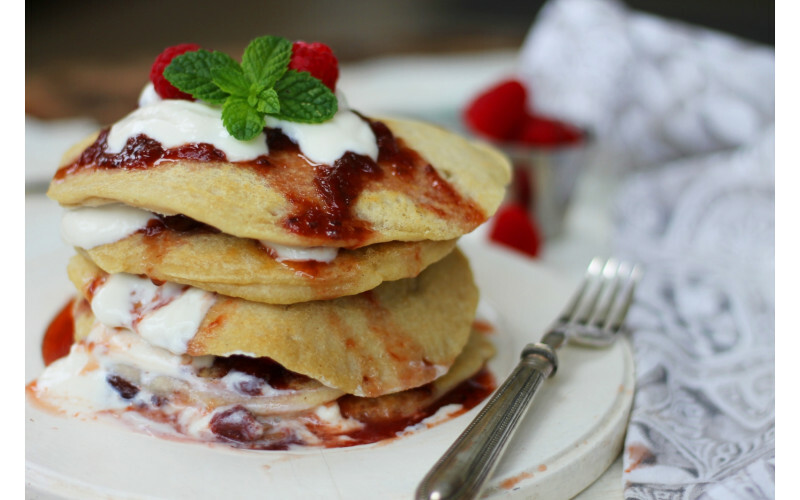 ​PS It's actually pretty easy and very cheap to make your own vegan pancakes - see our simple recipe here. You can even make it up as a dry mix and store it. All you have to do is add liquid and oil before making! Mix the batter according to the packet instructions. Heat a frying pan - preferably non-stick - and drizzle in a little oil once it's very hot. A hot pan makes better pancakes. Using a ladle or similar, drizzle in the batter, tilting the pan and swirling it slightly to distribute the batter evenly over the pan. Fry for a minute or two, then flip, using a fish slice or similar. Each side should be a light golden brown. Serve hot and eat immediately.